In Eighteenth century England a general rise in the sale of Gin was occurring. Gin was becoming more and more popular. 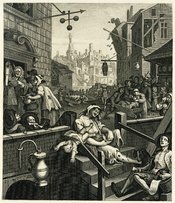 Some English citizens approved and supported the sale of Gin while others did not. Some English people just wanted to stay neutral and produce a compromise between the two. Various reasons and purposes account for the difference in opinions but the Gin Act of 1751 formulated debate from all groups in society. Some citizens approved and supported the sale of Gin in England. England at that time had already gone through the extraordinary Agriculture Revolution. The new technologies brought by the Revolution had tripled England's wheat supply and had forced the sale and demand of wheat to plummet. People supported gin because it could help them as well as their government by providing relief from the over production of wheat. This remedy would in turn produce more demand and improve sales. WriteWork contributors. "Gin DBQ" WriteWork.com. WriteWork.com, 07 August, 2001. Web. 23 Apr. 2019.